Short transit lanes on the approach to major intersections, sometimes paired with active signal priority, allow transit vehicles to bypass long queues that form at major cross streets. 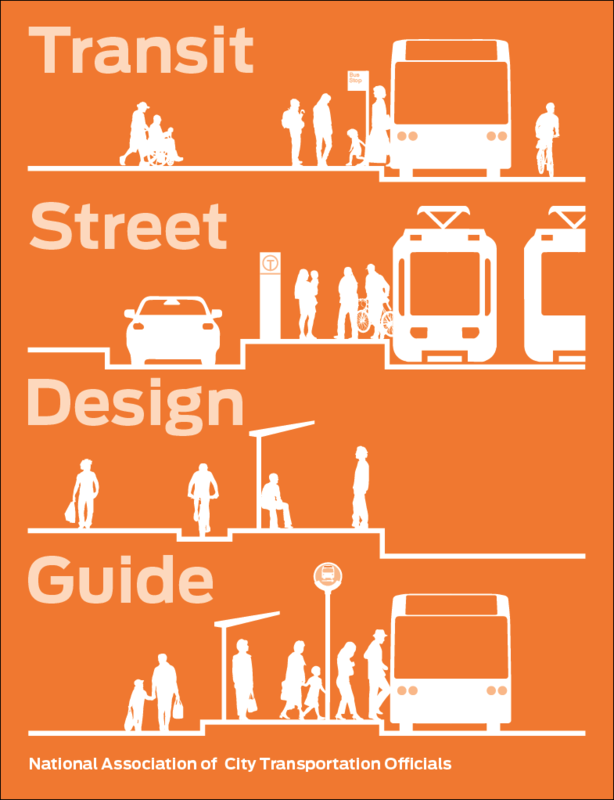 Since these streets often have long signal cycles or break the progression of the transit street, they often present a significant source of delay across downtown, neighborhood, and corridor transit streets. Transit approach lanes let the transit vehicle stay in its lane, a major benefit to both bus and streetcar lines. At the approaches to signalized intersections where transit encounters long delays. At locations with a high volume of motor vehicle right turns. Signalized intersections with transit operating in a curbside or offset lane. Where a bicycle intersection approach is provided in a similar manner, with a dedicated lane and a right-turn pocket to the right. Where a right-turn/queue jump with signal priority is not practical, such as locations with long right-turn queues. For streetcars in otherwise mixed traffic, the transit approach lane is often the best geometric configuration for transit priority without lateral shifts. Allow transit vehicles to bypass general vehicle queues and right-turn queues. Transit vehicles proceed into the approach lane without changing lanes, an advantage over combined right-turn/queue lanes—this is especially important for retrofitting existing streetcar lines, and reduces delay for both bus and rail. Allows separate signal phases or other accommodation of right-turning traffic. At locations with high and variable right-turn volumes, it may be difficult to plan a right-turn lane that prevents queues across the transit approach lane. Motor vehicle queues will typically lengthen when a dedicated lane is provided to transit. On streets with short blocks, longer queues can block crossing multi-modal traffic. Motor vehicle queues can be managed by reducing the green signal time available upstream of a major intersection, requiring separate transit signals to achieve a benefit for transit. Automated enforcement is often needed to create an effective transit lane on streets with a through or arterial function for motor vehicle traffic. The transit approach lane must be conspicuous and enforceable. Use clear signage and pavement marking to communicate to motorists the exclusivity of the transit approach lane. The dedicated approach lane should be long enough to allow the transit vehicle to fully bypass a routinely forming queue. Queue length calculations must account for the additional length of the queue after a general traffic lane is reassigned to a transit lane; in the example shown, this length is twice the pre-existing queue length. Right turns either should be accommodated with a dedicated turn pocket/turn lane to the right of the transit approach lane, or should be restricted to prevent queuing in the transit lane. Consider the use of flexible delineators or other vertical elements between the general through lane and the transit lane. Transit stops may be located on either side of the intersection. 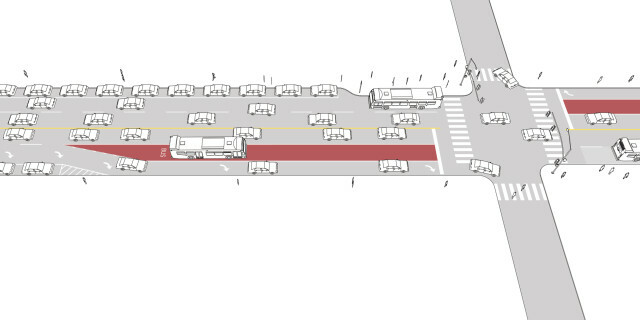 Near-side stops, or mid-block stops for very long transit approach lanes, may be provided along the transit approach lane, using a boarding island if a right-turn lane is provided to the right of the transit approach lane. References for Transit Approach Lane/Short Transit Lane: 1 found.